So a Nexus 5 apparently got left at a bar. It happens! And when it happens, pictures get taken and we lucky folks get to see what one of the most anticipated phones of the year looks like up close. It matches up quite nicely with the leaked phone in the Android 4.4 Kit Kata promo video—horizontal Nexus branding, large camera lens—and definitely seems to be the same LG phone cruising through the FCC right now. Really, there's no surprise with the Nexus 5 anymore. When leaks start matching other leaks that match that same leak that shows the same thing, you're pretty much looking at the real deal. This is the next Nexus phone. 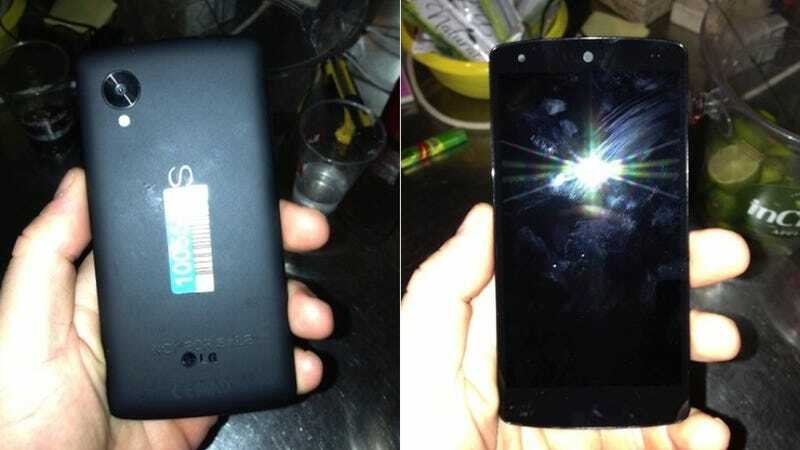 And now that the Nexus 4 is off the digital shelves, this is probably the Nexus 5. The phone—which clearly reads NOT FOR SALE on the back and is made by LG—has the beautifully clean button-less front face we've grown used to in the Nexus line but is less rounded (a good thing) than previous Nexus phones. It looks like what all phones look like these days, which is mostly a good thing. We'll see if that's true in real life soon enough.